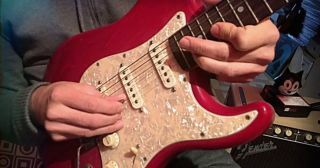 In this lesson, we are going to expand on my previous lessons—"How to Seamlessly Play Arpeggios Over Three Octaves" and“How to Seamlessly Play 7th Arpeggios Over Three Octaves” —while adding pentatonic scales to the mix. Not only will this lesson help expand your musical vocabulary, but it may also change how you visualize and navigate the fretboard. Whatever pattern of notes you play on the first pair of strings, you can repeat an octave higher by simply performing the same thing on the next pair of strings, but two frets higher. You can do it again, another octave higher, by performing the same thing on the next pair of strings, albeit three frets higher up the neck than before. In this lesson, we will do this with the five positions of the A minor pentatonic scale. Below are the five positions of the pentatonic scale played over three octaves. Check out the video above for specific fingerings, and to see and hear these examples. Make sure to practice these slowly, with alternate picking, transitioning from octave to octave by simply moving your whole hand up the neck, keeping the ‘shape’ of the pentatonic scale in your hand. Guitarist Adrian Galysh is a solo artist, session musician, composer and educator. He's the author of Progressive Guitar Warmups and Exercises. Adrian uses Suhr Guitars, SIT Strings, Seymour Duncan pickups and effects, Brian Moore guitars, Voodoo Labs, D'Angelico guitars and Morley pedals. For more information, visit AdrianGalysh.com. GuitarWorld.com readers can enjoy a FREE five-song EP download by clicking HERE.